Mario, in promotional artwork for New Super Mario Bros. U (2012). Mario (Japanese: マリオ, Hepburn: Mario?) is a fictional character in the Mario video game franchise by Nintendo, created by Japanese video game designer Shigeru Miyamoto. Serving as Nintendo's mascot and the eponymous protagonist of the series, Mario has appeared in over 200 video games since his creation. Depicted as a short, pudgy, Italian plumber who resides in the Mushroom Kingdom, he repeatedly rescues Princess Peach from the Koopa villain Bowser and stops his numerous plans to destroy him and take over the kingdom. Mario also has other enemies and rivals, including Donkey Kong and Wario. Mario is said by many to be the most famous character in video game history. Mario games, as a whole, have sold more than 210 million units, making the Mario franchise the best-selling video game franchise of all time. Outside of the Super Mario platform series, he has appeared in video games of other genres, including the Mario Kart racing series, sports games, such as the Mario Tennis and Mario Golf series, role-playing video games such as Paper Mario and Super Mario RPG, and educational games, such as Mario Is Missing! and Mario's Time Machine. He has inspired television shows, film, comics and a line of licensed merchandise. Since 1995, he has been voiced by Charles Martinet, who first got the role in 1990. Seen on his hat, Mario's emblem represents him in the interfaces of many of the games in which he has appeared. Shigeru Miyamoto created Mario while developing Donkey Kong in an attempt to produce a best-selling video game for Nintendo; previous titles like Sheriff had not achieved the same success as titles like Pac-Man. Originally, Miyamoto wanted to create a video game that used the characters Popeye, Bluto, and Olive Oyl. At the time, however, Miyamoto was unable to acquire a license to use the characters (and would not until 1982), so he ended up making Jumpman (later known as Mario), Donkey Kong, and Pauline. In the early stages of Donkey Kong, Mario was unable to jump, and the focus was to escape a maze. However, Miyamoto enabled Mario to jump, saying "If you had a barrel rolling towards you, what would you do?" Miyamoto originally named the character "Mr. Video", and he was to be used in every video game Miyamoto developed. According to a widely circulated story, during localization of Donkey Kong for North American audiences, Nintendo of America's warehouse landlord Mario Segale confronted its then-president Minoru Arakawa, demanding back rent. Following a heated argument in which the Nintendo employees eventually convinced Segale he would be paid, they opted to name the character in the game Mario after him. Miyamoto commented that if he had named Mario "Mr. Video", Mario likely would have "disappeared off the face of the Earth." By Miyamoto's own account, Mario's profession was chosen to fit with the game design. Since Donkey Kong was set on a construction site, Mario was made into a carpenter. When he appeared again in Mario Bros., it was decided he should be a plumber, since a lot of the game is played in underground settings. Mario's character design, particularly his large nose, draws on western influences; once he became a plumber, Miyamoto decided to "put him in New York" and make him Italian, lightheartedly attributing Mario's nationality to his mustache. Other sources have Mario's profession chosen to be carpenter in an effort to depict the character as an ordinary hard worker, and make it easier for players to identify with him. After a colleague suggested that Mario more closely resembled a plumber, Miyamoto changed Mario's profession accordingly and developed Mario Bros., featuring the character in the sewers of New York City. Due to the graphical limitations of arcade hardware at the time, Miyamoto clothed the character in red overalls and a blue shirt to contrast against each other and the background. A red cap was added to let Miyamoto avoid drawing the character's hairstyle, forehead, and eyebrows, as well as to circumvent the issue of animating his hair as he jumped. To make him appear human onscreen despite his small size, Mario was given distinct features, prominently a large nose and a mustache, which avoided the need to draw a mouth and facial expressions on the small onscreen character. Miyamoto developed Mario with the idea of using him as a "go to" character that could be put into any title as needed, albeit in cameo appearances, as at the time Miyamoto was not expecting Mario to become popular. To this end, he originally called the character "Mr. Video", comparing his intent to have Mario appear in later games to the cameos done by Alfred Hitchcock within Hitchcock's films. Over time, Mario's appearance has become more defined; white gloves, brown shoes, a red "M" in a white circle on the front of his hat and gold buttons on his overalls have been added. The colors of his shirt and overalls were also reversed from a blue shirt with red overalls to a red shirt with blue overalls. Miyamoto attributed this process to the different development teams and artists for each game as well as advances in technology as time has gone on. Nintendo has never revealed Mario's full name, stating only that it was not "Mario Mario" despite the implication of the Mario Bros. series' title, its use in the live-action film adaptation, and information given in the Prima official Guidebook to Mario and Luigi: Superstar Saga. Mario first debuted as "Jumpman" in the arcade game Donkey Kong on July 9, 1981. He is shown as a carpenter that has a pet ape. The carpenter mistreats the ape, so Donkey Kong escapes and kidnaps Jumpman's girlfriend, originally known as the Lady, but later named Pauline. The player must take the role of Jumpman and rescue the girl. The character was later renamed "Mario" in the 1982 arcade game Donkey Kong Junior, the only game in which he has ever been portrayed as an antagonist. In the 1983 arcade game Mario Bros., Mario and his younger brother Luigi are portrayed as Italian-American plumbers who have to defeat creatures that have been coming from the sewers below New York. Their surname was "Mario", resulting in Mario's full name being first given here as "Mario Mario". In Super Mario Bros. for the Nintendo Entertainment System, Mario saves Princess Toadstool (later known as Princess Peach) of the Mushroom Kingdom from King Koopa. To save Princess Toadstool, Mario conquers the eight worlds of the Mushroom Kingdom by going to the castle in each to defeat a minion of King Koopa. To reach each castle, Mario battles through three sub-worlds by defeating King Koopa's henchmen. If Mario successfully fights his way through the castle and defeats the minion, he frees a Mushroom Retainer. Inside the eighth castle, Mario has a final fight with King Koopa and frees Princess Toadstool. In Super Mario Bros. 2, the player could choose between Mario, Luigi, Toad, or Princess Peach. Each character possesses unique abilities (Luigi has stronger jumping ability, Toad can dig the fastest, and Peach can float), with Mario being the most well-rounded. In Super Mario Bros. 3, Mario quests to save the rulers of seven kingdoms from Bowser and his children, the Koopalings, and Mario travels across eight worlds to restore order to the Mushroom World and to rescue Princess Peach. Mario is introduced to new power-ups that augment his abilities. In Super Mario Land an alien named Tatanga appears, hypnotizes the inhabitants of an area called Sarasaland, and kidnaps its ruler, Princess Daisy. Mario then sets out to rescue her from Tatanga, traveling through the four geographical areas of Sarasaland and defeating Tatanga's minions along the way. He finally corners Tatanga in the skies of the Chai kingdom, bringing down Tatanga's alien warship and rescuing Daisy. In Super Mario World, Mario and Luigi take Princess Peach for a vacation in Dinosaur World sometime after the events of Super Mario Bros. 3; during the vacation, Peach is kidnapped by Bowser. Mario and Luigi meet the Yoshis, dinosaurs that live in Dinosaur World, and they help rescue Peach by allowing Mario and Luigi to ride them. In Super Mario Land 2: 6 Golden Coins, whose events take place immediately after the original Super Mario Land, Mario's evil counterpart Wario has put an evil spell over Mario Land while Mario was away in Sarasaland, renaming the area Wario Land. The inhabitants are now brainwashed into thinking that Wario is their master and Mario is their enemy. Wario's motive behind this sudden attack was to take control over Mario's castle in order to have one of his own. To stop Wario, Mario finds the 6 Golden Coins throughout Mario Land and regains access to his castle. In Super Mario World 2: Yoshi's Island, a stork carries Baby Mario and Baby Luigi across the sea, but the evil Magikoopa Kamek steals Baby Luigi, and Baby Mario falls onto an island called Yoshi's Island, home to Yoshis. After Mario meets the Yoshis, the group journeys through the game's six worlds to rescue Baby Luigi and the stork from Baby Bowser and Kamek. Super Mario 64 featured Mario's first 3D rendering. Mario made his 3D debut in Super Mario 64. Princess Peach sends Mario a letter inviting him to join her at her castle for cake; however, when he arrives, Mario discovers that Bowser has invaded the castle and imprisoned the princess and her servants within it using the castle's 120 Power Stars. Many of the castle's paintings are portals to other worlds, in which Bowser's minions guard the stars. Mario explores the castle and these other worlds to recover the stars. He gains access to more painting portals as he recovers more stars, and he traverses three obstacle courses that lead him to battles with Bowser. Defeating Bowser the first two times earns Mario keys that open new levels of the castle, while the final battle releases Peach, who rewards Mario by baking the cake that she promised him. In Super Mario Sunshine, Mario, Toadsworth, and Princess Peach take a vacation to Isle Delfino, a tropical island. A person resembling Mario, known as "Shadow Mario", vandalizes and pollutes the entire island using a magic paintbrush. The vandalism has also caused the Shine Sprites to flee from the island's main city, Delfino Plaza, and blanket the island in darkness. Blamed for the mess, Mario is arrested by the island authorities and ordered to clean up Isle Delfino. Mario is equipped with FLUDD, a robotic hosing device invented by Professor E. Gadd, which he uses to clean up the pollution and collect the Shine Sprites. Meanwhile, Peach is kidnapped by Shadow Mario, who reveals himself to be Bowser Jr., one of Bowser's children, having stolen the paintbrush from Professor E. Gadd. Mario eventually confronts Bowser and Bowser Jr. and rescues the princess. With the island cleaned up, Mario and Peach begin their vacation. Mario went to 2.5D in New Super Mario Bros. While Mario and Peach take a walk together through the Mushroom Kingdom, Bowser Jr. kidnaps Peach and flees. Mario gives chase, venturing through eight worlds. Mario eventually catches up, defeating both Bowser and Bowser Jr. and rescuing Peach. In Super Mario Galaxy, Mario is invited by Princess Peach to the centennial Star Festival in the Mushroom Kingdom. Upon arrival, Bowser invades the kingdom and rips Peach's castle from its foundations and lifts it into outer space. After failing to prevent the princess from being kidnapped, Mario meets star-like creatures called Lumas and their companion, Rosalina. Rosalina tells Mario that Bowser has stolen the Power Stars, the source of power for Rosalina's mobile observatory, and has taken Peach to the center of the universe. Mario then travels to various galaxies to reclaim the Power Stars to restore power to the observatory and reclaim Princess Peach. In New Super Mario Bros. Wii, another 2.5D game, Mario, Luigi, and two Toads are attending Princess Peach's birthday party when Bowser Jr. and the other seven Koopalings ambush the princess and kidnap her. Mario, Luigi, and the two Toads chase after them across eight worlds, defeating each Koopaling as they progress. The quartet eventually confronts Bowser, defeating him and reclaiming the princess. In Super Mario Galaxy 2, Bowser, who has transformed himself into a giant using the Power Stars, attacks the Mushroom Kingdom and abducts Peach, taking her to the center of the universe. With the help of the Lumas, Mario pilots Starship Mario, a mobile planet in the shape of his head, in order to travel to various galaxies and gather the Power Stars, used to fuel the ship. After multiple battles against both Bowser and Bowser Jr., Mario eventually arrives at Bowser's lair at the center of the universe, where he defeats him and rescues the princess. In 2012, Mario returned in New Super Mario Bros. 2 where he collects several coins scattered across the Mushroom Kingdom in addition to saving Princess Peach from the evil clutches of Bowser and the Koopalings. Mario returns once more to defeat Bowser and his minions in New Super Mario Bros. U. Mario will be one of the playable characters in Super Mario 3D World. Mario games of other genres include various Game & Watch games; Mario Pinball Land, a pinball game for the Game Boy Advance; various educational games; and the Dr. Mario puzzle games, (with Dr. Mario itself first released in 1990). In these games, Dr. Mario throws vitamins that the player must align to destroy the viruses that populate the playing field. 1996's Super Mario RPG: Legend of the Seven Stars for the Super Nintendo Entertainment System is the first Mario role-playing game; seven games have followed, including four in the Paper Mario series (Paper Mario for the Nintendo 64, Paper Mario: The Thousand-Year Door for the Nintendo GameCube, Super Paper Mario for the Wii and Paper Mario: Sticker Star for the Nintendo 3DS) and four in the Mario & Luigi series (Mario & Luigi: Superstar Saga for the Game Boy Advance, Mario & Luigi: Partners in Time and Mario & Luigi: Bowser's Inside Story for the Nintendo DS, and Mario & Luigi: Dream Team for the 3DS). Several other sub-series of Mario video games, especially those inspired from sports, have been released. The Mario Kart franchise, which began with Super Mario Kart for the Super Nintendo Entertainment System in 1992, is currently the most successful and longest-running kart racing franchise. Other Mario sports games include the Camelot-developed series Mario Golf and Mario Tennis, and, respectively, the baseball and soccer games Mario Superstar Baseball and Super Mario Strikers. In 1999, the Hudson-developed Mario Party series began on the Nintendo 64. The games revolve around a set of minigames and are playable with up to four players. Mario & Sonic at the Olympic Games, released for both Nintendo DS and Wii, is a collection of 24 events based on the 2008 Summer Olympic Games from Beijing, in which characters from Sega's Sonic the Hedgehog series compete with Mario characters. This was followed in 2009 by Mario & Sonic at the Olympic Winter Games on both systems, based on the 2010 Winter Olympics in Vancouver. Two more sports games for the Wii was released in 2011, Mario Sports Mix and the third Mario & Sonic game, Mario & Sonic at the London 2012 Olympic Games while the latter was released for the Nintendo 3DS in February 2012, which is based on the 2012 Summer Olympics in London. The fourth edition of the Mario & Sonic series will be released this winter 2013 for the Wii U called Mario & Sonic at the Sochi 2014 Olympic Winter Games, which is based on the 2014 Winter Olympics in Sochi. Mario as a playable fighter in Super Smash Bros. Brawl with Lakitu. Apart from his platformer and spin-off game appearances, Mario has made guest appearances in non-Mario games, such as Mike Tyson's Punch-Out! !, where Mario is a referee. Mario has also appeared as a playable character in NBA Street V3 and SSX on Tour, both by Electronic Arts. He makes cameo appearances in both The Legend of Zelda: A Link to the Past and The Legend of Zelda: Ocarina of Time as a portrait, and in Metal Gear Solid: The Twin Snakes, he appears as a small statue. Mario has appeared in every game of the Super Smash Bros. series and has retained his balanced abilities even when fighting characters from other series. The game also includes other Mario characters, items, and stages. Mario's alter egos Dr. Mario and Metal Mario have made series appearances as well. The Super Mario Bros. Super Show! television series and the live-action film Super Mario Bros., both based on the video game series, brought Mario into the TV and film entertainment realms. The television show starred "Captain" Lou Albano as Mario, and the film starred Bob Hoskins as Mario Mario, a plumber who finds himself in an alternate universe (in which dinosaurs rule) where he must save the Earth from invasion. Outside the original games, television shows, and film, Mario has influenced the creation of a line of licensed merchandise and has appeared in popular culture. The Nintendo Comics System series, along with the Nintendo Adventure Books, were created due to Mario as well. Mario was originally portrayed as a two-dimensional sprite, but in later games, he is shown as a three-dimensional, polygonal model. He is depicted as a portly plumber who lives in the fictional land of the Mushroom Kingdom with Luigi, his younger, taller brother. In the television series and film, Mario and Luigi are originally from Brooklyn, New York. Little is known of Mario's childhood, though the infant version of Mario, Baby Mario, first appeared in 1995 in Super Mario World 2: Yoshi's Island, and has often appeared in Nintendo sports games since that time. Baby Mario has a major role along with Baby Luigi in Mario & Luigi: Partners in Time and appears in Yoshi's Island DS. He (along with the adult Mario) is voiced by Charles Martinet. Mario's occupation is plumbing, though in the original Donkey Kong games he is a carpenter. Mario has had several other occupations: in the Dr. Mario series of puzzle games, which debuted in 1990, Mario is portrayed as a medical physician named "Dr. Mario"; in the Game Boy game Mario's Picross, Mario is an archaeologist; and in Mario vs. Donkey Kong 2: March of the Minis, Mario is the president of a profitable toy-making company. Mario is also an athlete in various Mario sports titles including Mario Sports Mix, Mario Strikers Charged, and Mario Golf: World Tour; as well as a kart racer in the Mario Kart series. Mario usually saves Princess Peach and the Mushroom Kingdom and purges antagonists, such as Bowser, from various areas. Mario has gained fame in the Mushroom Kingdom due to his heroic deeds, as shown in Mario & Luigi: Superstar Saga, where the brothers are referred to as "superstars". Since his first game, Mario has usually had the role of saving the damsel in distress. Originally, he had to rescue his girlfriend Pauline in Donkey Kong from Donkey Kong. Pauline was soon replaced by a new damsel in distress, Princess Peach, in Super Mario Bros., but returned in the Game Boy remake of Donkey Kong in 1994, and in Mario vs. Donkey Kong 2: March of the Minis in 2006, although the character is now described as "Mario's friend". Mario has rescued Princess Peach multiple times since Super Mario Bros. In a role reversal, Peach rescues Mario in Super Princess Peach. Mario rescued Princess Daisy of Sarasaraland in Super Mario Land, but Luigi seems to be more linked to her. In Super Smash Bros. Melee, the text explaining Daisy's trophy states that "after her appearance in Mario Golf, gossips portrayed her as Luigi's answer to Mario's Peach". Luigi is Mario's younger brother. He is a companion in the Mario games, and the character whom the second player controls in two-player sessions of many of the video games, though he occasionally rescues Mario, as seen in Mario is Missing! and Luigi's Mansion. Super Mario Land 2: 6 Golden Coins for the Game Boy saw the arrival of Wario, Mario's greedy counterpart, who is often Mario's antagonist or an antihero. Yoshi is a dinosaur whose species is also named Yoshi. They vary in color, but the original Yoshi is green. Yoshi serves as Mario's mount in games such as Super Mario World, and is depicted as a more sentient creature in games like Super Mario Kart and Yoshi's Island. During the development of Donkey Kong, Mario was known as Jumpman. Jumping—both to access places and as an offensive move—is a common gameplay element in Mario games, especially the Super Mario Bros. series. By the time Super Mario RPG: Legend of the Seven Stars was released, jumping became such a signature act of Mario that the player was often tasked with jumping to prove to NPCs that he was Mario. Mario's most commonly portrayed form of attack is jumping to stomp on the heads of enemies, first used in Super Mario Bros. This jump-stomp move may entirely crush smaller enemies on the stage, and usually deals damage to larger ones, sometimes causing secondary effects. This attack often enables Mario to knock the turtle-like Koopa Troopas into or out of their shells, which can be used as weapons. Subsequent games have elaborated on Mario's jumping-related abilities. Super Mario World added the ability to spin-jump, which allows Mario to break blocks beneath him. The Game Boy version of Donkey Kong allowed Mario to jump higher with consecutive jumps, and perform a back-flip. In Super Mario 64, Mario gains new jumping abilities, such as a sideways somersault, a ground pound, and the "Wall Jump", which propels him upwards by kicking off walls. Mario seen wearing the Tanooki Suit. The suit originated as a result of the developers being unable to implement the character Yoshi into Super Mario Bros. 3, and is derived from the Japanese raccoon dog, Tanuki. Mario uses items, which give him various powers, and differ between the games he's in. The first power-up Mario ever used was the Hammer in Donkey Kong. Super Mario Bros. introduced the basic three power-ups that have become staples for the series, especially the 2D games —- the Super Mushroom, which causes Mario to grow larger; the Fire Flower, which allows Mario to throw fireballs; and the Starman, which gives Mario temporary invincibility. These powers have appeared regularly throughout the series. Throughout the series' history, there have been several kinds of Mushroom power-ups, including the 1-Up Mushroom, which gives Mario an extra life; the Poison Mushroom, which causes Mario to either shrink or die; the Mega Mushroom, which causes Mario to grow very large; and the Mini Mushroom, which causes Mario to shrink. A reoccurring power-up throughout the series is an item that gives Mario the ability of flight. The first of this type was introduced in Super Mario Bros. 3: One power-up, which gives Mario a raccoon suit, is called the Super Leaf, while another is called the Tanooki Suit (a transliteration of Tanuki) and grants Mario the ability to fly or turn into a statue. In Super Mario World, an item called the Cape Feather was introduced that gave Mario a cape. In Super Mario Land 2: 6 Golden Coins, a carrot was available that gave Mario rabbit ears that allowed him to fly, and in Super Mario 64, Mario could acquire an item called the Wing Cap, which temporarily gave him the ability of flight. Super Mario Sunshine introduces a pump-water spraying device named "F.L.U.D.D. ", which abilities included spraying water and hovering. Super Mario Galaxy introduced new power-ups, including the Bee Mushroom, which turned Mario into a bee and allowed him to fly temporarily; the Boo Mushroom, which turned Mario into a ghost, allowing him to float and pass through walls; the Spring Mushroom, which encased Mario in a spring, allowing him to jump higher; and the Ice Flower, which allowed the player to temporarily walk on water and lava without sinking or taking damage. Super Mario Galaxy 2 introduced even more power ups alongside those introduced in Super Mario Galaxy, including the Cloud Flower which allows Mario to create platforms in midair and Rock Mario, which transforms Mario into a boulder that could be used to break through barriers. New Super Mario Bros. Wii updated the Ice Flower, which then allowed Mario to shoot ice balls that temporally froze enemies; and also introduced the Propeller Mushroom, which allows him to fly; as well as the Penguin Suit, which allows Mario to easily traverse ice and swim through water in addition to shooting ice balls. Super Mario 3D Land introduced the Boomerang Flower, which allows Mario to throw boomerangs at nearby enemies; and the Statue Leaf, which allows Mario to turn to a statue. In New Super Mario Bros. U, a Super Acorn makes its debut. This transforms Mario to his new Flying Squirrel form where he can glide and stick on walls. As Nintendo's mascot, Mario is considered by some to be the most famous video game character in history, and has been called an icon of the gaming industry. The Mario series of video games has sold more than 200 million copies (210 million as of 2009), making it the best-selling video game franchise of all time. Mario was one of the first video game character inductees at the Walk of Game in 2005, alongside Link and Sonic the Hedgehog. Mario was the first video game character to be honored with a wax figure in the legendary Hollywood Wax Museum in 2003. In the 1990s, a national survey found that Mario was more recognizable to American children than Mickey Mouse; in fact, Mario has been called the "most recognisable" figure in the gaming industry. Since his creation, Mario has established himself as a pop culture icon, and has starred in numerous television shows, comic books, and in a feature film. He has appeared on lunch boxes, t-shirts, magazines, commercials (notably, in a Got Milk? commercial), in candy form, on shampoo bottles, cereal, badges, board games, and as a plush toy. Nintendo of Japan produced a 60-minute anime feature which starred Mario and his friends in 1986, although this film has never been released outside of Japan. The animated series The Super Mario Bros. Super Show! featured a live-action series of skits which starred former WWF manager "Captain" Lou Albano as Mario and Danny Wells as Luigi. Mario appeared in a book series, the Nintendo Adventure Books. Mario has inspired unlicensed paintings, performances on talent shows such as India's Got Talent, and short films, which have themselves been viewed hundreds of thousands of times. Many people and places have been named (or nicknamed) after Mario. 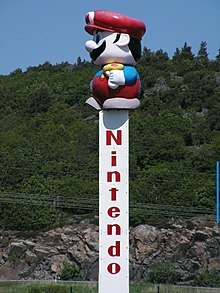 Bergsala, the distributor of Nintendo's products in the Nordic and the Baltic countries, is located at Marios Gata 21 (Mario's Street 21) in Kungsbacka, Sweden, named after Mario. Many sports stars, including Bundesliga football players Mario Götze and Mario Gómez, NHL hockey player Mario Lemieux, Italian footballer Mario Balotelli, and Italian cycling star Mario Cipollini have been given the nickname "Super Mario". In the Spanish suburb of Zaragoza, in commemoration of Mario a street was named "Avenida de Super Mario Bros". Mario's legacy is recognized by Guinness World Records, who awarded the Nintendo mascot, and the series of platform games he has appeared in, seven world records in the Guinness World Records: Gamer's Edition 2008. These records include "Best Selling Video Game Series of All Time", "First Movie Based on an Existing Video Game", and "Most Prolific Video Game Character", with Mario appearing in 116 distinct titles (not including remakes or re-releases). Creator Shigeru Miyamoto has stated that Mario is his favorite character out of all that he has created. Nintendo Power listed Mario as their favourite hero, citing his defining characteristics as his mustache, red cap, plumbing prowess, and his mushrooms. In a poll conducted in 2008 by Oricon, Mario was voted the most popular video game character in Japan, outranking characters such as Cloud Strife from Final Fantasy VII and Solid Snake from the Metal Gear Solid series. GameDaily listed the "unlikely hero" on its top 25 video game archetypes, and used Mario as an example of this. It stated that in spite of the fact that he should have run out of energy through the first level, he kept going. Mario ranked fourth on GameDaily's top ten Smash Bros. characters list. Mario was fourth on UGO's list of the "Top 100 Heroes of All Time". They also listed Mario's hat twenty-first on their list of "The Coolest Helmets and Headgear in Video Games", stating "there’s always somebody at your Halloween party wearing one." CNET listed him first on its list of the "Top 5 video game characters". He was voted 100th in IGN's Top 100 Villains for his appearance in Donkey Kong Junior, adding "This Mario is a total jerk, holding Donkey Kong Jr.'s dad hostage", and he have also been elected by GamesRadar as the 90th "most dastardly ne'er-do-wells" villain in video games in their "top 100". ^ a b c "Nintendo's Shining Star: The History of Mario". Gamecubicle. Retrieved 2008-08-23. ^ "ELAN Awards Announce the Winners of Their Honourary [sic] Awards" (Press release). ELAN Awards. 2009-04-06. Retrieved 2009-11-07. ^ "Charles Martinet Down Under". N-Sider. Retrieved 2006-11-12. ^ a b c d e f g h i j k McLaughlin, Rus (2010-09-13). "IGN Presents: The History of Super Mario Bros.". IGN. Retrieved 2013-06-24. ^ a b Orlando, Greg (2007-05-15). "Console Portraits: A 40-Year Pictorial History of Gaming". Wired News. Retrieved 2008-08-23. ^ a b "Iwata Asks: New Super Mario Bros.". Wii.com. Nintendo. p. 1. Retrieved 2013-06-24. ^ Edwards, Benj (April 25, 2010). "The True Face of Mario". Technologizer. Retrieved June 30, 2011. ^ Eric Pryne (March 27, 2010). "Powerful Segale family has massive vision for Tukwila expanse". The Seattle Times. Retrieved June 30, 2011. ^ a b c d Mike Snider (Nov 08, 2010). "Q&A: 'Mario' creator Shigeru Miyamoto". USA Today. Retrieved 2010-11-09. ^ Kohler, Chris (2008-06-27). "Q&A: 90 Minutes With Miyamoto, Nintendo’s Master of Amusement". IGN.com. Retrieved July 30, 2010. ^ a b Arakawa, Minoru (1991). Mario Mania. Nintendo. pp. 30-32. ASIN B000BPL42C. ^ "Iwata Asks: New Super Mario Bros.". Wii.com. Nintendo. p. 2. Retrieved 2013-06-24. ^ Reporter: Joel Loy (1989). "Inside Super Mario Bros". Inside Edition. CBS Television Distribution. ^ "Retro Diary". Retro Gamer (Bournemouth: Imagine Publishing) (104): 13. July 2012. ISSN 1742-3155. OCLC 489477015. ^ Kohler, Chris (2005). Power-Up: How Japanese Video Games Gave the World an Extra Life. Brady Games. p. 39. ISBN 0-7440-0424-1. ^ "Mario Bros. at Nintendo - Wii - Virtual Console". Nintendo.com. Retrieved 2013-06-24. ^ Sheff, David (1999). Game Over Press Start to Continue. Cyberactive Media Group. p. 56. ISBN 0-9669617-0-6. ^ Super Mario Bros. Instruction Booklet. Nintendo of America. 1986. ^ "The Good". TMK Super Mario Bros. Complete Guide. Retrieved 2008-08-27. ^ "The Eight Kingdoms". Super Mario Bros. 3 Instruction Booklet. Nintendo of America. 1990-02-12. ^ Nintendo Power Staff (May/June 1990). "Super Mario Bros. 3: Strategy Guide on the Way". Nintendo Power (Nintendo) (12): 94–95. ^ Nintendo (1989). Super Mario Land Instruction Booklet. Nintendo of America, Inc.
^ Super Mario World Instruction Booklet. Nintendo. ^ "FEATURE: Galaxy Quest". Edge. September 25, 2007. Retrieved February 16, 2010. ^ "Full Coverage — Super Mario 64". Nintendo Power (Nintendo) (88): 14–23. September 1996. ^ a b Official Super Mario 64 Player's Guide. Nintendo. 1996. ^ Super Mario 64 Instruction Booklet. Nintendo. 1996. NUS-NSME-USA. ^ Super Mario Sunshine instruction booklet. Nintendo. 2002. pp. 20–23. ^ Nintendo EAD. Super Mario Sunshine. (Nintendo). Nintendo GameCube. (2002-08-26) FLUDD: The vacation starts now! ^ New Super Mario Bros. manual. Nintendo. 2006-05-16. p. 10. ^ "Prologue". Super Mario Galaxy Instruction Booklet. Nintendo of America. 2007. ^ Casamassina, Matt (November 7, 2007). "Super Mario Galaxy Review". IGN. pp. 1–2. Retrieved January 25, 2009. ^ "New Super Mario Bros. Wii: Your Questions Answered!". Official Nintendo Magazine. 2009-10-23. Retrieved 2009-11-11. ^ Matt Wales (2010-06-10). "Super Mario Galaxy 2 - Wii Review". Uk.wii.ign.com. Retrieved 2011-08-20. ^ Byron, Tom (November 20, 2004). "Mario Pinball Land (Game Boy Advance)". 1UP.com. Retrieved January 25, 2010. ^ a b c "Dr. Mario". IGN. Retrieved January 24, 2010. ^ East, Tom (September 19, 2008). "Virtual Console Review: Super Mario RPG". Official Nintendo Magazine. Retrieved February 17, 2010. ^ Jenkins, David (10/01/2007). "Mario Tops Best Selling Game Franchise List". Gamasutra. Retrieved 2009-01-01. ^ Pigna, Kris (August 9, 2009). "Mario Included in NES Punch-Out!! Without Miyamoto's Permission". 1UP.com. Retrieved January 28, 2009. ^ "Mario to hoop it up in NBA Street V3". GameSpot. Retrieved May 4, 2009. ^ "SSX On Tour Character Spotlight: Mario, Luigi, and Peach". GameSpot. Retrieved May 4, 2009. ^ "Mario". Smash Bros. DOJO!!. Smashbros.com. 2007-11-29. Retrieved 2009-06-03. ^ "Mario". Smash Bros. DOJO!!. Smashbros.com. 2007-11-29. Retrieved 2009-06-03. "An easy-to-use character, Mario sets the standard for balance." ^ "At the Movies:Super Mario Bros.". Archived from the original on 2008-09-21. Retrieved January 25, 2010. ^ a b c d "Mario Biography". IGN. Retrieved January 23, 2010. ^ a b c "Luigi Biography". IGN. Retrieved January 26, 2010. ^ "Charles Martinet: Voice Over". Retrieved 2008-03-16. ^ "History of Nintendo Worldwide 1980-1990". Nintendo of Europe GmbH. 2013. Retrieved 2013-06-24. ^ "Top Ten Mario Games". GameTrailers. July 24, 2007. Retrieved January 30, 2010. ^ "Story and Characters". Mario vs. Donkey Kong 2: March of the Minis Instruction Booklet. Nintendo of America. 2006-09-25. ^ "Mario and Luigi: Superstar Saga". Nintendo. Archived from the original on 2007-10-21. ^ a b Trueman, Doug. "GameSpot Presents: The History of Donkey Kong". Gamespot. Retrieved January 1, 2010. ^ "Mario vs. DK 2: March of the Minis". Yahoo! Games. Archived from the original on 2011-09-27. Retrieved 2008-08-23. ^ Bozon, Mark (February 1, 2006). "Hands-On: Super Princess Peach". IGN. Retrieved January 23, 2010. ^ "Princess Daisy Biography". IGN. Retrieved January 27, 2009. ^ "Luigi Profile". IGN. Retrieved January 26, 2010. ^ Buchanan, Levi (August 7, 2008). "The Other Mario Games, Vol. 2". IGN. Retrieved January 23, 2010. ^ "Wario Biography". IGN. Retrieved January 23, 2010. ^ a b c "Yoshi Biography". IGN. Retrieved January 23, 2009. ^ Suellentrop, Chris (2007-11-05). "Super Mario Bros.: The Lost Levels reviewed. - By Chris Suellentrop - Slate Magazine". Slate.com. Retrieved 2009-04-04. ^ Harris, Craig. "IGN: New Super Mario Bros. Review". Uk.ds.ign.com. Retrieved 2009-04-04. ^ Provo, Frank (2007-11-09). "Super Mario Bros. 3 Review for Wii - GameSpot". Uk.gamespot.com. Archived from the original on 2009-03-10. Retrieved 2009-04-04. ^ a b "Top 10 Mario Suits". IGN. November 16, 2009. Retrieved January 23, 2010. ^ Navarro, Alex (2007-02-09). "Super Mario World for Wii Review - GameSpot". Uk.gamespot.com. Archived from the original on 2007-07-14. Retrieved 2009-04-04. ^ "Super Mario 64 at Nintendo :: Wii :: Virtual Console :: Games". Nintendo.com. Retrieved 2013-06-24. ^ "Super Mario Sunshine Review for GameCube - GameSpot". Uk.gamespot.com. 2002-10-04. Retrieved 2009-04-04. ^ "Mario's Special Moves". Super Mario Galaxy Instruction Booklet. Nintendo of America. 2007. ^ "Mario's Special Moves". Super Mario Galaxy 2 Instruction Booklet. Nintendo of America. 2010. ^ Buchanan, Levi (February 13, 2009). "Is There a Bad Mario Game?". IGN. Retrieved January 23, 2010. ^ "Past Inductees 2005 Games / Characters". Walk of Game. Archived from the original on 2008-01-21. Retrieved 2008-02-21. ^ Iwabuchi, Koichi. "1. Taking Japanization seriously: Cultural globalization reconsidered". Recentering globalization: Popular culture and Japanese transnationalism. Duke University Press. p. 30. ISBN 978-0-8223-2891-9. ^ Plunkett, Luke (2010-09-13). "Happy 25th Birthday, Super Mario Bros.". Kotaku. Archived from the original on 2010-10-18. Retrieved 2010-10-18. ^ "10 Works of Art Inspired By Super Mario Bros.". Pixelated Geek. Retrieved 2009-05-05. ^ Ashcraft, Brian (July 13, 2009). "India’s Got Mario Talent". Kotaku. Retrieved 17 May 2012. ^ "Bergsala AB, Contact page". Retrieved 2013-06-24. ^ "ESPN.com: Mario was super despite the obstacles". Espn.go.com. Retrieved 2009-04-04. ^ Brian Crecente. "What Were Your Greatest Gaming Moments of 2010?". Kotaku. Archived from the original on 2011-07-13. ^ "Exclusive Interview With Nintendo Gaming Mastermind Shigeru Miyamoto". Popular Mechanics. 2009-10-19. Retrieved 2009-10-21. ^ Brian Ashcraft (2008-08-23). "And Japan's Favorite Video Game Characters Are...?". Kotaku. Retrieved 2008-08-23. ^ Buffa, Chris (January 23, 2009). "Top 25 Game Archetypes". GameDaily. Archived from the original on 2009-02-17. Retrieved January 1, 2010. ^ "Top 10 Smash Bros. Characters - Page 7". GameDaily. Archived from the original on 2009-10-23. Retrieved 2009-08-07. ^ Staff (2007-09-24). "Best Heroes of All Time: Mario". UGO Networks. Retrieved 2009-11-08. ^ Marissa Meli (March 4, 2011). "The Coolest Helmets and Headgear in Video Games - UGO.com". UGO.com. Retrieved 2011-03-21. ^ "Top 100 Villains". IGN. Archived from the original on January 6, 2012. Retrieved 2010-05-13. ^ "100 best villains in video games". GamesRadar. May 17, 2013. Retrieved July 28, 2013. This page was last modified on 4 October 2013 at 19:20.